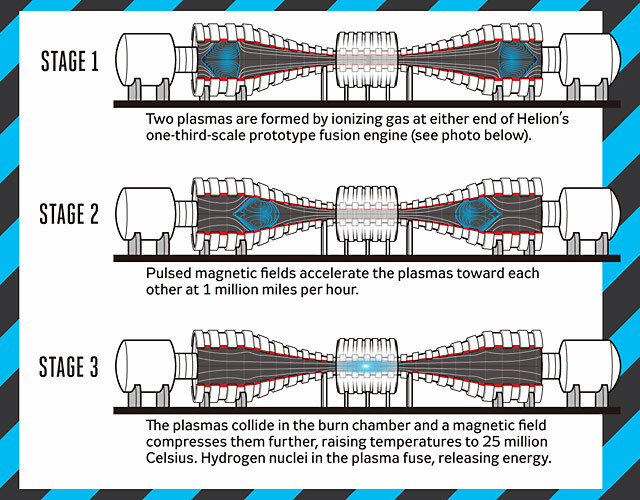 The Redmond device, dubbed the Fusion Engine, is the brainchild of a company called Helion Energy, and relies on a very different method of establishing and confining plasmas known as a field-reversed configuration. Discovered at the US Naval Research Laboratory in Washington DC in 1960, this process involves accelerating two small, compact balls of plasma into one another at a speed of hundreds of kilometres a second. The conditions created by the collision should, in theory, be sufficient to force the nuclei together, heat them and ignite fusion. ...In a peer-reviewed paper published in April this year, Helion researchers show how they used the technique to smash two plasmas together and achieve a temperature of 25 million degrees. That's still well below what is needed to ignite fusion, but the team also published calculations showing that ignition - and even break-even - should be possible in a device just three times the size of their prototype (Nuclear Fusion, vol 51, p 053008). 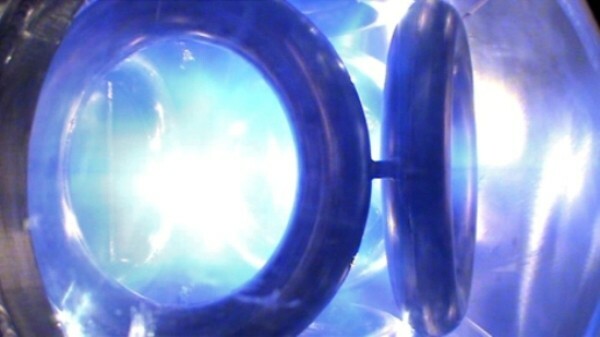 ...Also pursuing the dream is the Canadian firm General Fusion based in Burnaby, British Columbia, using a method called magnetised plasma fusion. This set-up also emerged from the US Naval Research Laboratory, this time in the late 1970s. It involves igniting fusion in a plasma violently compressed within a cavity created in a spinning sphere of liquid metal. Bussard inertial electrostatic confinement fusion (EMC2 Fusion) involves an electrostatic plasma confinement to achieve fusion. The history and development of the concept is explained in a video reached via the link above. The Bussard IEC has been financed almost entirely by the US Navy. EMC2 is based near Santa Fe, New Mexico. Lawrenceville Plasma Physics is based in New Jersey. 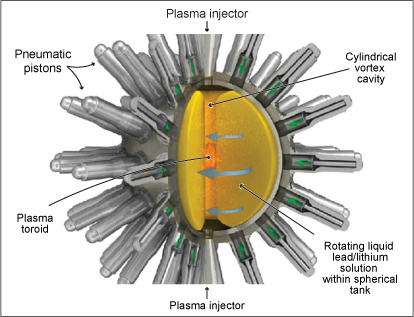 The dense plasma focus approach uses a special pulsing "spark plug" to ionise a gas, and to form a plasmoid "pinch," with the emission of high energy photons, ions, and fusion neutrons. Hyper V Technologies utilises a spherical array of mini railguns to accelerate plasma beams into a central target of deuterium or deuterium-tritium, to achieve fusion (hopefully). TriAlpha is an Irvine, California venture, which has been fairly successful in the venture capital game. TriAlpha is a bit secretive with non-investors, but you can read their patent for yourselves. The concept seems to involve the highly sophisticated evolution from an earlier colliding beam fusion approach. General Fusion is a small startup headquartered near Vancouver, BC. The compression of plasma to achieve fusion is accomplished by a coordinated spherical plasma compression, using pneumatics and advanced switching. Helion Energy is located in Redmond, Washington. It is based on a principle of "colliding plasmas," and like all the rest of the small fusion approaches, it is a long shot.